The world’s most visual CRM that lets you see everything, online as well as offline! Note: Dell Inspiron i15R-2105sLV (running both Windows7 and Windows10) and Samsung Galaxy S5 were used to test the desktop (Principia 8.0) and mobile (8.0.1) versions of the Pipeliner CRM. 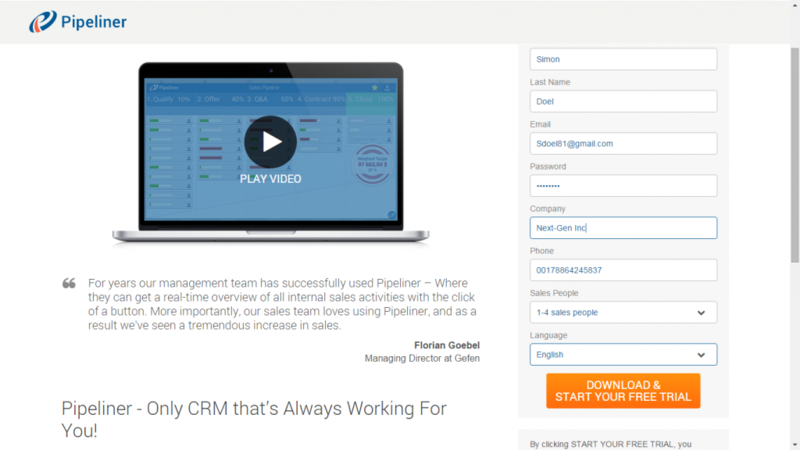 Pipeliner is a visual CRM targeted at sales people, that’s available both online and offline. It has an elegant design and is simple to use, though there’s a slight learning curve for the beginners. 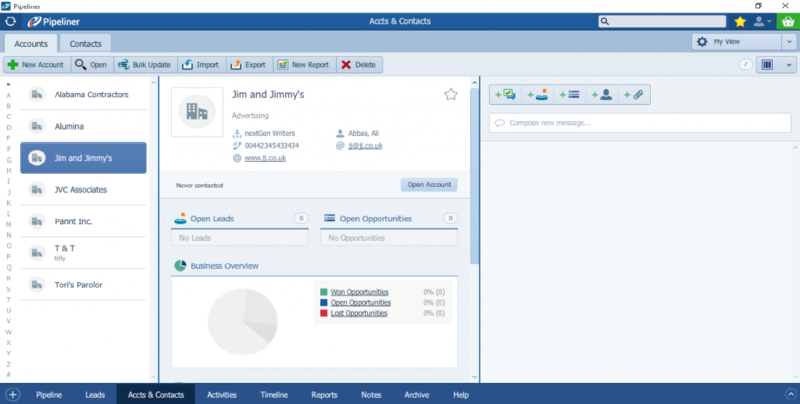 It makes sales force automation a snap and comes with some unique features such as visual Task Boards and instant, one-click reports. Pipeliner lets you manage your contacts, companies, sales process, create custom sales stages and define targeted actions within those stages. To enable a seamless flow of info between different systems, it integrates with many popular apps such as MS Outlook, Gmail, Calendars etc. Pipeliner is designed purely for sales persons and misses several important modules such as marketing, customer care, project management etc. The only option to get these functionalities is to integrate paid third party apps, which will surely increase the cost. Ideal for SMBs, it’s specially targeted at sales pros in health care, investment banking, legal services, manufacturing, real estate, transportation, telecom, and consulting services. Headquartered in Los Angeles, California and Vienna, Austria, Pipelinersales Inc. has offices in several countries including the UK, Sweden, Slovakia, India, the Middle East, and Asia/Pacific. Their tech team has been around for quite a while, and is behind the global platform of World-Check (acquired by Thomson Reuters), in use by more than 5,000 banks. 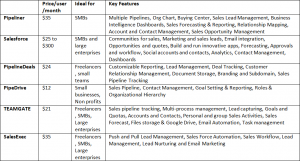 Pipelinersales Inc. started market research in 2007 and introduced Pipeliner (beta version) in 2009. 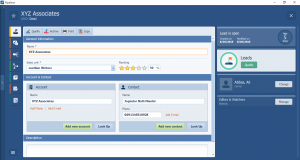 In 2010, they moved the CRM to cloud and have been continuously adding more features to it since then. 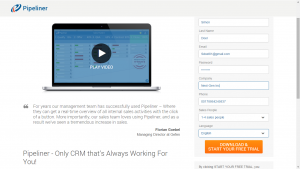 Pipeliner CRM offers 30-day free trial. But since it’s not a web based CRM, you’ll have to download the 71 MB setup on every single device you intend to use it on – the data, however, is stored in the cloud. This surely is a hassle, but on the flip it has its own perks: you can access your data even when you’re offline. Just make sure that you close the software instead of signing out, because if you sign out, the locally stored data will be deleted and downloaded when you log in again. The good thing is that software took about a minute or two to download and install on both the laptop and smartphone. 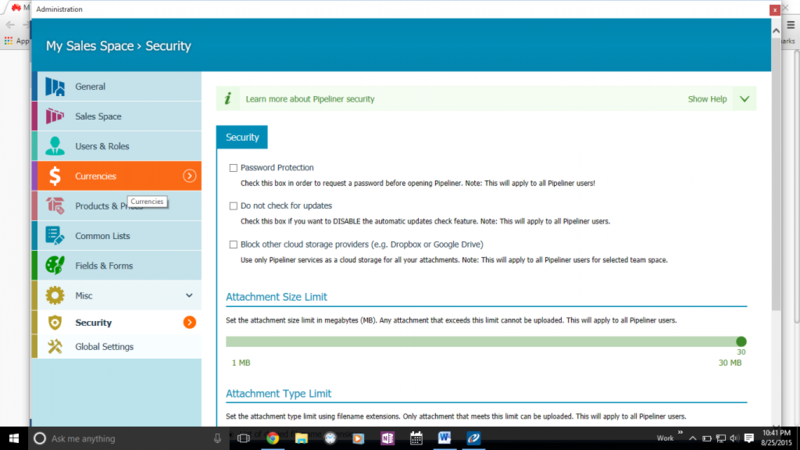 Just make sure you’ve installed the Adobe AIR platform on your computer, or Pipeliner might not work. When you log in for the first time, you’re prompted to import data as well as contacts. Importing contacts was a snap, the only little glitch we noticed was mapping the fields, because not all the fields in our data matched those on the CRM. Though you can add custom fields to the entities over backend so that they match the fields in your data, you have to abort the import process and go to the Admin panel. There are several CRMs that let you add custom fields on the same page as you’re importing the data which seems more logical. The overall process was quick and seamless, but downloading and installing the app can be a pain if you often switch devices. Despite a few little glitches here and there, we totally loved the work area and user-friendly interface on both Desktop and mobile versions. The company boasts that Pipeliner has the world’s most visual interface, and their claim makes sense. The work space is not only elegant and simple, but also extremely well thought out. You can view details about any field by simply hovering your mouse over it, and updating any field takes one or two clicks/taps. Most things can be done by drag and drop. The related info to a contact, lead or opportunity is on the same page. You can create a new lead while you’re viewing a company’s details and vice versa. The menus seem to be just in the right place, and there are quick add and favorite buttons that let you quickly add or access your frequently used options. From adding new data to searching for a particular record to generating one-click reports, everything can be done with a couple of mouse clicks. There’s a slight learning curve for new users. There are buttons that might not make much sense to a first-timer, and there are no tooltips. You can’t open multiple records at the same time. For example, if you open any record such as a contact or an opportunity, it takes up the entire screen and focus, and won’t let you do anything else until you close it first. But you can update multiple records using the Bulk update, which lets you update certain records that satisfy your criteria. The work area can be essentially divided into two major sections: admin section, which is a kind of a control panel, and your dashboard where you have your Pipeline, Contacts, Leads and other menus. We’ll talk about them shortly. Pipeliner is neither cheap nor too expensive. There are cheaper options e.g. PipeDrive, TEAMGATE, PipelineDeals (which may cost from $12 up to $25 per user per month), and then there are more expensive options such as Salesforce, Sugar CRM, MS Dynamics, SAP etc. 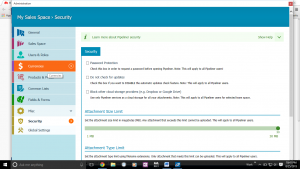 (which may cost from $30 to over $300 per user per month). 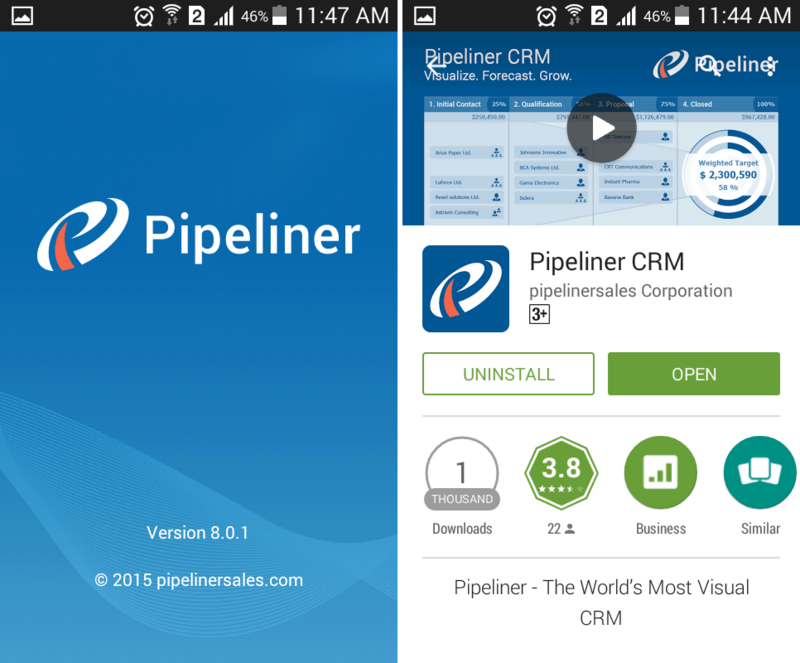 Pipeliner CRM has one, simple pricing plan: $35 per user per month (billed annually). It includes all the features, plus tech support. Each license is associated with the user and not with a machine. So multiple machines can have the same license but each user will have their own unique license. 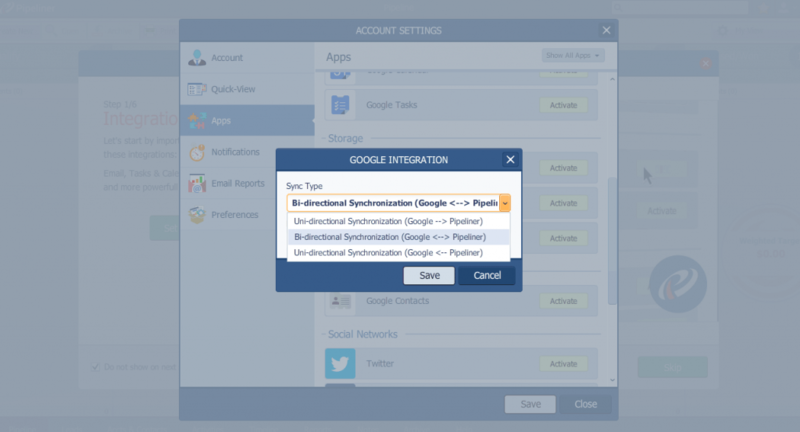 To let you expand your CRM platform, sync or share data, Pipeliner CRM integrates with a wide variety of apps including MS Outlook, Office, Google Contacts, Gmail, Google Drive, GoToWebinar, ZenDesk, Shopify, Mail Chimp, Magento, all the major social media portals and many others. Also, their API lets your in-house or contracted programmers write a custom integration. Pipeliner is highly customizable, just as their slogan says “What you see is what you can change”. 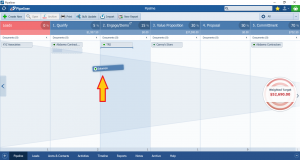 From renaming, deleting fields to adding custom fields, everything can be done with simple drag-and-drop functionality. 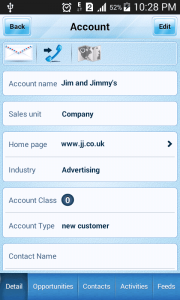 The CRM has an app for Android devices, which we thoroughly tested, as well as an app for iOS devices. Both executives and staff members have access to almost everything available in the full version. We, however, noticed a minor glitch when using the Android app: when we synced data using the mobile app, it didn’t instantly sync unless we synced from the laptop first or waited for the auto sync. 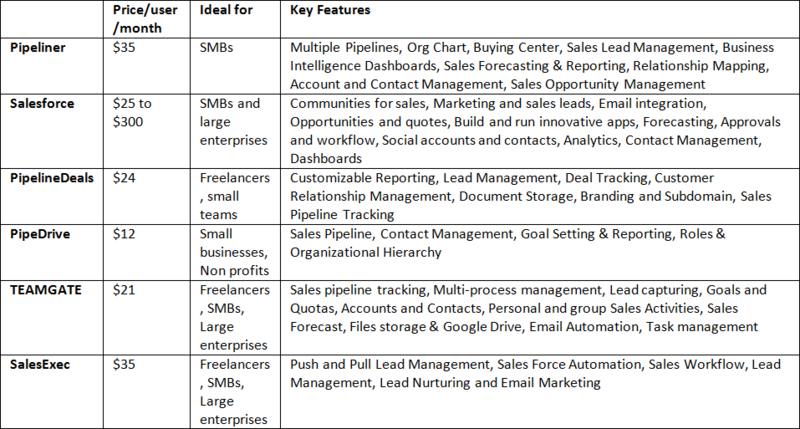 Pipeliner CRM can be scaled and customized according to your business needs. 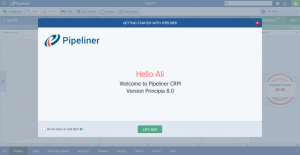 They also have an API that lets you connect the CRM with other applications or use the API to build other apps that connect to Pipeliner CRM. The customer support is available Monday-to-Friday. We contacted them on Friday through their web-based contact form, but only received their response after four days and two email reminders. However, let’s not forget that we contacted them just before the weekend, and our case was unique since we were only interested in reviewing the CRM. The customer support was very helpful, and gave detailed answers to our probing queries. In addition to the web form and email based support, Pipeliner also offers chat for quick response. Pipeliner uses industry leading Amazon Web Services (AWS) to host your cloud data. In addition to disaster recovery protection of AWS, Pipeliner CRM has an internal mechanism for a secondary site to be available within 24 hours as well as an offline snapshot system is available for up to 3 months, and daily online full backup is available for 12 days. 2048 bit cypher using SSL is used on all communications outside of the DMZ. 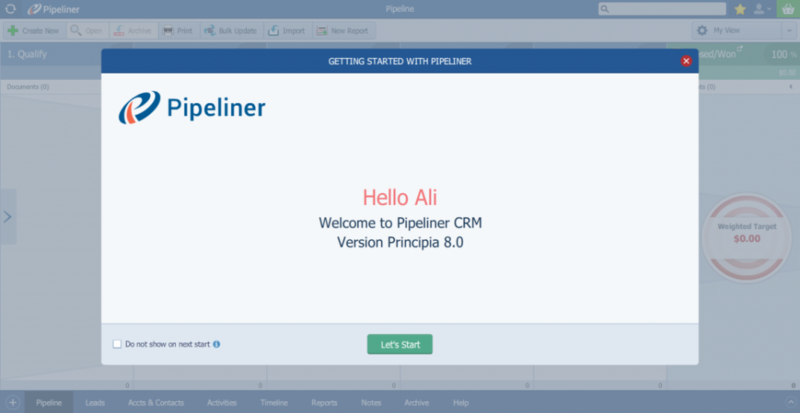 Pipeliner CRM has so many features that it’s almost impossible to cover all of them, so we’ll discuss the most important ones. Accounts are companies that you do business with, while contacts are people. 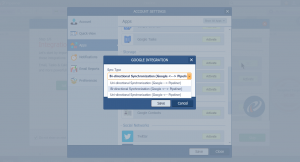 This feature enables data automation; when you enter email address or URL for any account or contact, Pipeliner automatically searches online for publically available info such as avatar, address, title, social media accounts, and more, and automatically fills in the details. You can choose multiple contacts, accounts or opportunities that satisfy certain criteria, and update all of them simultaneously. It shows visual relationships of who is reporting to whom, and who is the influencer, decision maker or even gatekeeper, at the company you have in your Accounts. Again, the lead management system is great; you can assign, rank, qualify, or archive leads with one click. But the best thing is that you can create your own rating system for lead scoring. 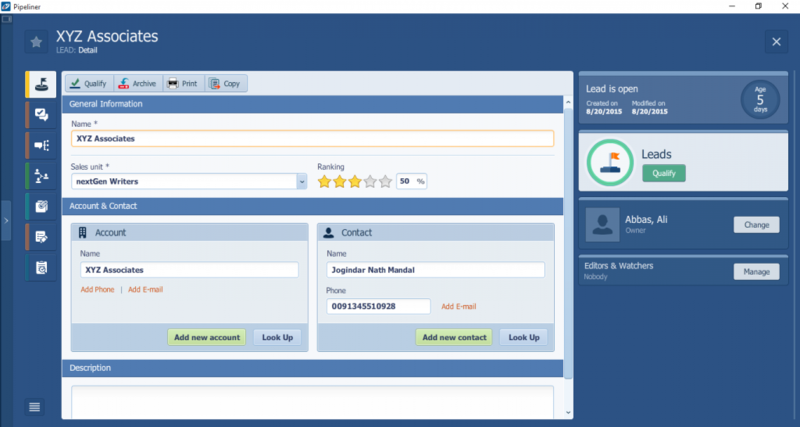 You can customize sales stages or manually move leads between stages. 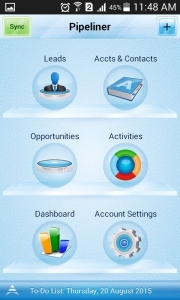 In addition to the basic details, you can also add activities, feeds, buying center details, documents, and notes. Opportunities can also be audited by executives. Leads can be manually added or imported in the CSV format, but unfortunately, there are no built-in web forms or lead capturing mechanism, just like we see in competitors such as Salesforce or PipelineDeals. This functionality is available only if you integrate the GravityForm feature with Pipeliner –different versions of the plugin cost $39, $99 and $199/year. Once you qualify a lead, it becomes an opportunity. Activities related to opportunities can be created in an intuitive, visual way so that no opportunity is missed. You can archive, bulk update opportunities or add buying center details, deals, documents, profiles, and tasks. 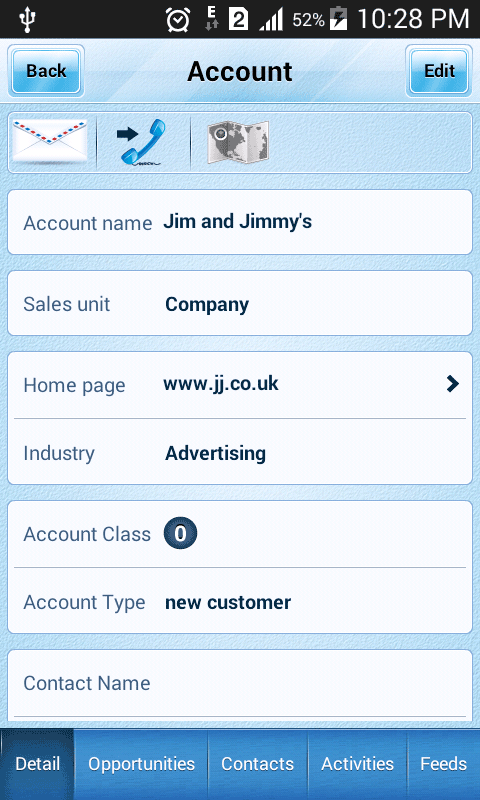 Pipeliner CRM also gives insight into customers and prospects by giving you access to their social profiles. 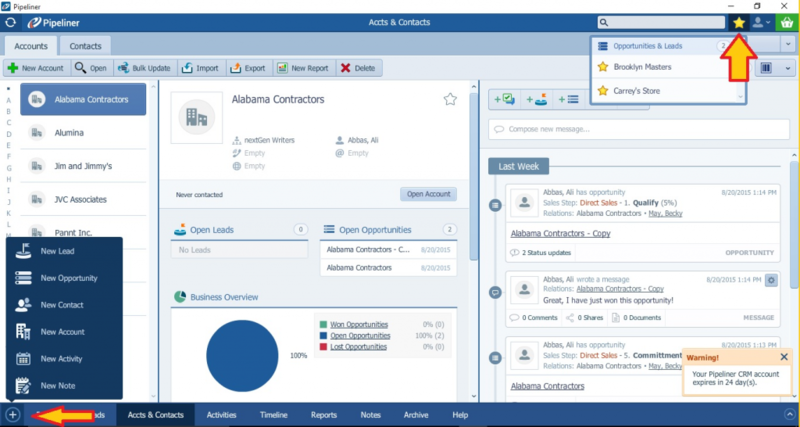 The visual, interactive and intuitive pipeline makes managing your opportunities and sales processes very easy. You can easily create up to five different sales targets, and the CRM will keep you updated on tasks that you should perform to achieve your goals. The visualization of the pipeline gives you a clear view of the health of your pipeline to get multiple, actionable insights all from one view. 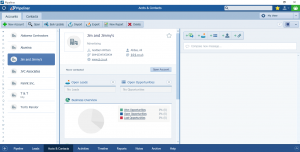 Whether you’re a manager or sales employee, you can create specific views /profiles relevant to you. The dynamic sales funnel lets you view and align yourself with different stages your buyers go through. You can define actions and activities to help guide your buyers from lead to sale. You can also define custom sales process and then view sales velocity: see which opportunities are going at the desired pace, and which are stalled and need more attention. 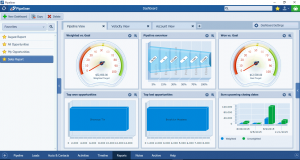 You get visual, detailed and interactive reports regarding a variety of indicators to make sales decisions. Business Intelligence features lets you drill down deep into your data to find out how to increase sales rate. 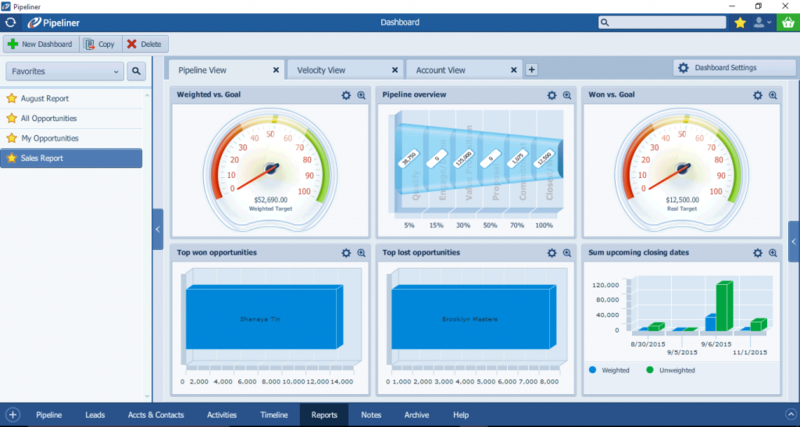 There are graphical dashboards, which can be initiated with a single click and offer insights into how your business is performing. Also, there are history logs, hit rate manager, and custom profiles. The customizable sales reports not only give management a clear view of their team’s progress, but also let the salespeople manage their own book of business. In other words, the CRM will offer key performance indicators without requiring an admin. You can populate tabs for any user, with info tailored for management, team members, or any user, and get in-depth comparisons, evaluations, and statistics. Pipeliner could integrate with more 3rd Party apps. We noticed that when used on mobile, Pipeliner is quite taxing on the battery.